Warehouse document holders, with self adhesive or magnetic fixing, suitable for housing documents, sizes A2 to A5. These frame holders are available in five colour schemes (black, blue, green, red and yellow) to international safety colours, with a clear face covering for protecting not only works documents, but also instructions, notices, memos, leaflets or signs. The frames can be used vertically or horizontally. The magnetic frames can be applied to flat steel or ferrous surfaces, and can be removed and re-positioned if required, allowing total flexibility on location, while leaving no damage, marks or residue on any surfaces. The alternative are frames with adhesive backing for permanent fixing at a single location. 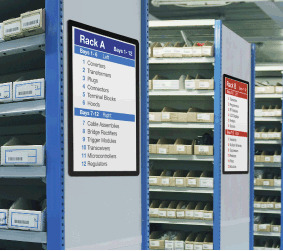 While thse can be used in warehouses, stores or at points of distribution, other application include manufacturing, offices, libraries, retail or commercial.